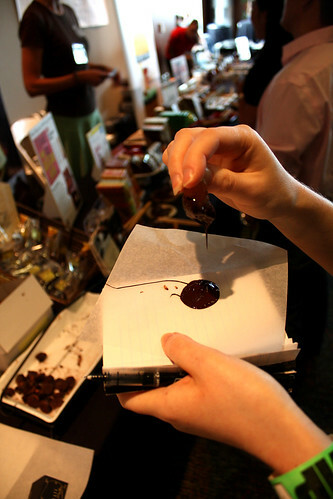 Reviews of chocolates and other products presented at the 2009 Seattle Chocolate Salon by Oh! 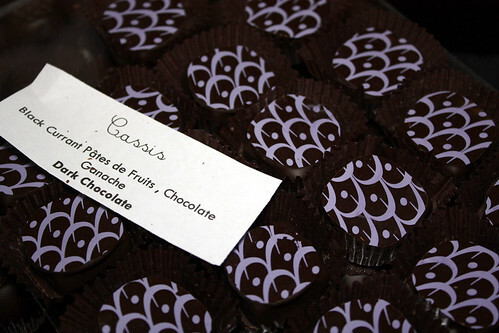 Chocolate, Theo Chocolates, Forte Chocolates, L’Estasi Dolce, Choffy, Eat Chocolates, Carter’s Chocolates, La Châtelaine Chocolat, Chocolopolis, Divine Chocolate, I Love Chocolate Jewelry, Posh Chocolat, Crave Chocolate, Amano Chocolate, Intrigue Chocolates, Suess Chocolates and William Dean Chocolates. My fortune wasn’t favorable just because I got a free ticket; Chris attended as my trusty photographer and we both felt that the experience was well worth the $20 he spent to get in. No, I also count myself lucky because if it hadn’t been for that email, I never would have known about the event at all. I don’t know if I live under a rock or what, but the only other place I’ve seen a mention of the event was in another food blog after I already had scored myself a ticket. To make matters worse, in the days leading up to the Salon, I felt a bit confused by the layout and wording of the site, and was unsure exactly what kind and quality of event I was going to be attending. So even if I had found out about it another way, if I hadn’t had that ticket already, I’m not sure the website would have convinced me to go. Which would have been a huge shame, because the event itself was all kinds of awesome. Several different varieties of awesome, in fact, that far exceeded both of our expectations. There was an overwhelming amount of chocolate to taste, really good chocolate made by people who really think about their craft. When the very friendly event staff at the will call table had banded us with VIP wrist straps (I’m pretty sure everyone was a VIP, but hey, it always feels pretty cool to be Very Important), one of them told me we were free to go in and make ourselves sick on chocolate. We got there almost four hours before the salon ended, and we still didn’t quite manage to hit every table, much less go to any of the chocolate demos they were holding in a side room off the main floor. Even so, I have to admit I did end up making myself ill. In my defense, this probably had as much to do with being pregnant as with the pound or two of rich, delicious chocolate I consumed. And I did it in the name of good journalism! I mean, really, it wouldn’t have been fair not to attempt to try every chocolate on display, even if I ultimately failed in that goal. What if I only tasted the chocolates I didn’t like on a table, and missed a few stellar ones I’d end up waxing poetic over? Eventually, I realized that was not the best way to go about things and started picking and choosing what I tasted. 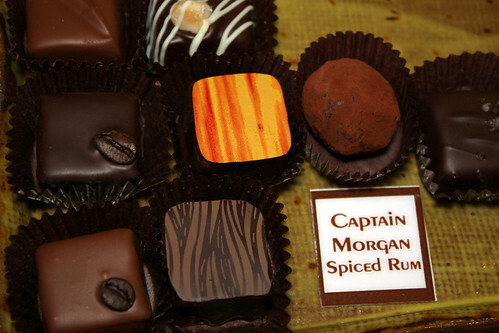 I noticed that certain flavors made appearances at a plurality of tables, and comparing the variations on chili, mojito or grapefruit chocolates ended up being a much better way to compare and contrast quality and style than trying to take everything in. I also went for the most unusual flavors the more creative chocolatiers were offering, and rarely was disappointed by what I chose. As time ran short, I reached for smaller and smaller chunks of chocolate and pieces of cut up confections, but I learned all those lessons too late. Still, the wonderful thing was that the whole room seemed to have magic chocolate bubble around it. 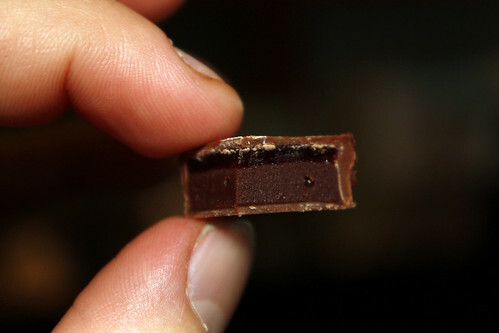 Even as I got fuller and fuller, I was still enjoying chocolate up until the very end. I didn’t start feeling queasy until we’d trudged back up the hill to our car, leaving the experience of the Salon itself untainted in my memories. Let’s leave the cautionary tale behind and proceed to the sights and tastes of the show! Theirs was the first table we stopped at, which was great because I believe they were the only table making chocolates on site. It was a fun way to get drawn into the festive atmosphere. They were hand-dipping glacéed apricots and handing them out, soft and dripping with still-melted chocolate. The apricots were moist, plump and sweet, perfect with the dark but not too bitter chocolate. 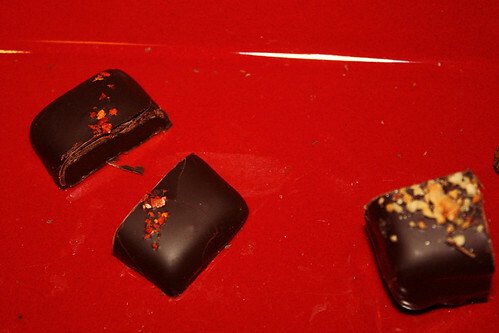 They were also offering two dipped chocolates: a mango habenero truffle and a fleur de sel orange honey caramel. I was impressed by both. Many chocolates boast chilies on their ingredient list, but previous to the Salon, neither Chris nor I had found any that captured enough chili flavor or heat to warrant mentioning the peppers on their packaging. We finally broke that unlucky streak, and Oh! Chocolates set the tone for the afternoon with a truffle that had a noticeable overtone of spiciness, well matched to the mango. 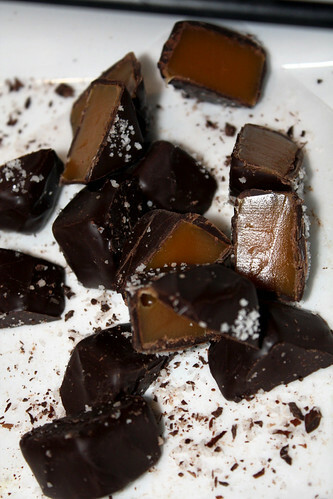 A few years ago, while working a booth at the Taste of Washington, I tasted my first (and I thought last) salted caramel from a different, well-established local chocolate company (who was oddly absent from the Salon) and couldn’t understand the appeal. At all. Since that was A.D. (After my love of Dark chocolate began) and not B.C. (Before I discovered good Chocolate), I don’t think my tastebuds have changed that much in the interim. So I must have been turned off by that one particular version of the flavor combo, because I quite enjoyed Oh! Chocolate’s salted caramel and many others I tasted after it. 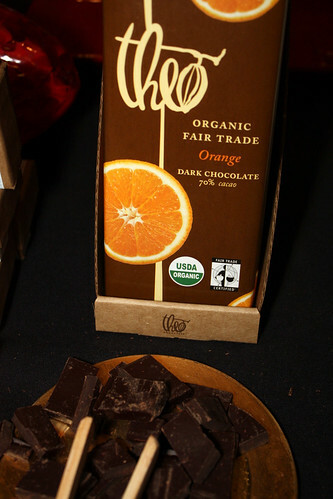 Theo Chocolate is located in the Fremont neighborhood of Seattle. They are one of only a handful chocolate makers in the US–meaning that they grind and process their own cacao beans–and they have the commendable distinction of being the only organic, fair trade chocolate maker in the country. 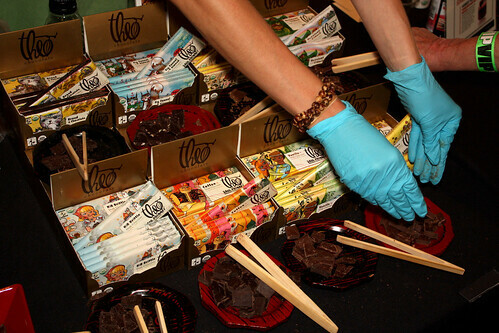 Okay, I have to admit something: I was not super excited when I saw the massive number of chocolates that Theo had out for Salon attendees to taste. Back when I went through my obsessive chocolate tasting phase in pastry school, I bought a bar of Theo chocolate and didn’t like it at all. It was better than some of the other organic bars available at the time, but I wasn’t taken by the flavor or texture, enough so that I remembered disliking the chocolate after the intervening years. You guessed it: Theo has super powers when it comes to coaxing the fruitiness of chocolate to the forefront. I found this was particularly interesting given that two of those single-origin bars come from Africa, and African chocolate is generally more on the bitter, coffee-ish side of the flavor spectrum, rather than on the fruity end. Not that I’m complaining; the bitterness is why I generally don’t like chocolate from Africa. Next came a few bars from Theo’s line of “classic combination” bars. Both the Orange bar and the Mint bar had nice, fresh, true flavors to them. I was a little less taken by the Cherry and Almond bar, since I found it difficult to search out much cherry or almond flavor in the piece I sampled. Then I tried a couple of their confections: the Ghost Chile caramel–great caramel center paired with a nice, definite heat that haunted the back of my throat as the chocolate went down–and the Peanut Butter Big Daddy–rich, with a nice crunchy layer inside. 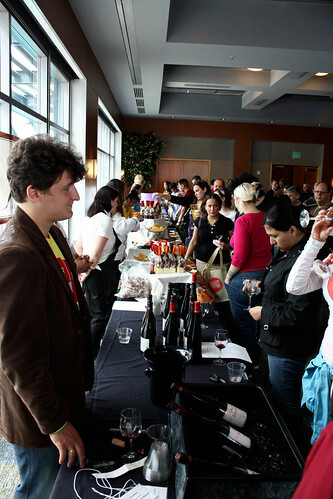 Finally, I made it down to the end of the table with the 3400 Phinney Bars, Theo’s line of more adventurous flavor blends. I didn’t taste all of them, but out of the ones I did, the Coconut Curry was the star. It somehow satisfied a savory curry craving and tasted great in the chocolate at the same time–quite a feat, really. Paired with the Chai bar, you can have a full meal and dessert at the same time. Among the other bars were the Fig, Fennel and Almond bar–very strong on the fennel flavor, not so much on the fig and almond–and the Hazelnut Crunch bar–lacking in hazelnut department, but with a surprising but pleasant saltiness to it. 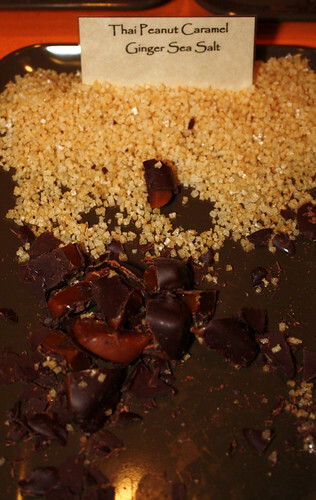 One of the big hits is the Bread and Chocolate bar, featuring toasted bread crumbs inside. We have a friend who is addicted to these. I just don’t get the attraction, mostly because I can barely taste the bread, but apparently I’m in the minority with that opinion. 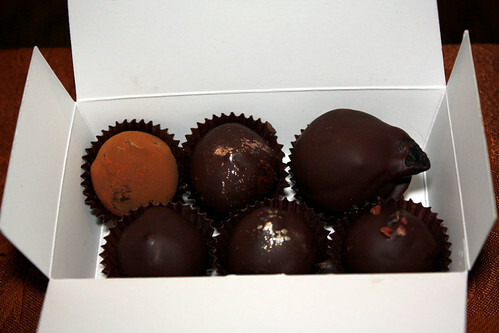 Forte Chocolates hails from Stanwood, Washington. In addition to some really good chocolate and caramels, they offer chocolate classes and custom chocolate and sugar showpiece creation. Chris didn’t get a photo of it, but she had a large, pretty monarch butterfly shimmering on her table, an element like the ones she would be featuring in a chocolate sculpture that was debuting that week at Teatro Zinzanni in Seattle. 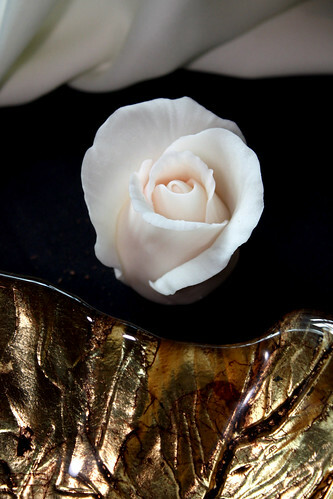 Also on the showpiece side of things was this gorgeous, delicate white chocolate rose. I was amazed at how realistic it looked, far beyond anything I could imagine being made out of modeling chocolate. She told me that it was her own blend of white chocolate, gumpaste, fondant and corn syrup, but was still composed of more than 50% white chocolate–amazing! Even the chocolate itself was aesthetically pleasing. I loved the shape the bars were molded into. The little squares showed off their well-tempered shine in the light coming from the bank of windows behind that row of tables. The 71% dark chocolate was creamy and fruity, and the 64% was it’s lighter, sweeter counterpart. 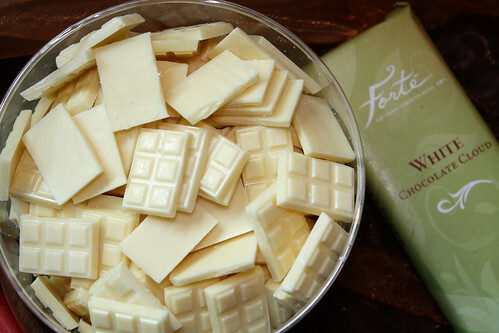 Even the white chocolate was good–and I rarely enjoy white chocolate–with a full measure of the wonderful creaminess that all of the Forte chocolates shared. 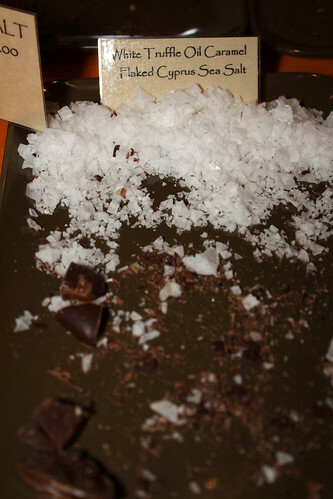 I liked the light touch of the salt on the sea salt caramels. The Chipotle Honey Caramels were getting the most attention at the Forte table. They were rich and buttery, with a distinct honey flavor and a sneaky kind of heat that only crept up on you once you had the whole, chewy piece in your mouth and couldn’t get away from it. 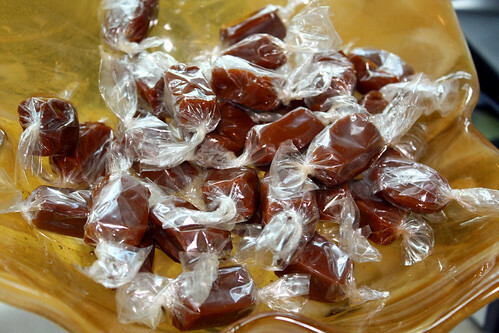 These were the kind of caramels that I could easy be satisfied with one tiny nibble off of the end, both because of the heat and the sticky richness. 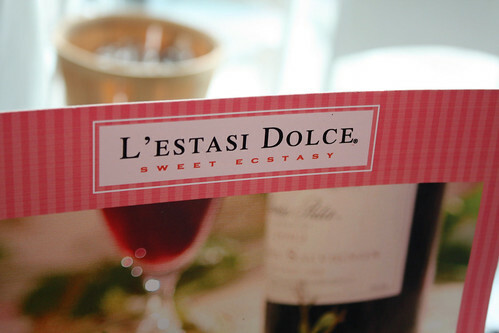 L’Estasi Dolce specializes in Asian-fusion and wine-infused chocolates. We got to their table a little later in the day than we should have, as we missed out on a few of their confections. But we were lucky enough to catch the last samples of some of the others, which was good because these were some of my favorite chocolates of the day. We missed out on most of the the Asian line of chocolates, based on the family recipes of the company’s founder, Rose Ramos-Benzel. But the two we did get to try were delicious: a Mint Ginger truffle bursting with fresh flavors and an amazing Lemongrass Ginger truffle. The lemongrass seemed to pair with the chocolate better than ordinary lemon ever could in any form. Apparently the recipe was based off of a crème brûlée they had once in New York. I’d definitely like to try to whip up my own version–both of the chocolate and the crème brûlée, and perhaps both at the same time. The wine truffles were also delicious, but more than that they were very intriguing in the way they morphed the wine into other flavors. 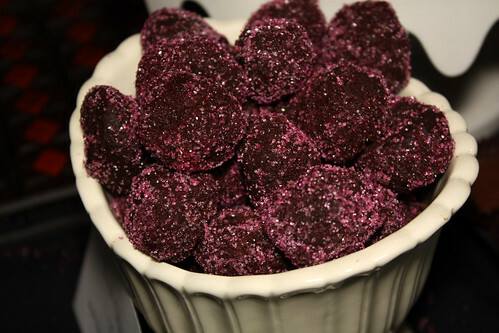 The Cabernet truffle–their best seller in the line of wine truffles–tasted of black cherry. The unexpected flavor in the Champagne truffle eluded Chris and me for a few minutes, but I finally spotted it: jackfruit, but only if jackfruit actually tasted good, because the truffle did. I also enjoyed the Mimosa truffle, which had a nice orange flavor from juice rather than rind. The Pinot Noir truffle was similar to the Cabernet but lighter in flavor, and the Port truffle was surprising in that it had less flavor from the alcohol than the others, when I was expecting more flavor from port than wine. 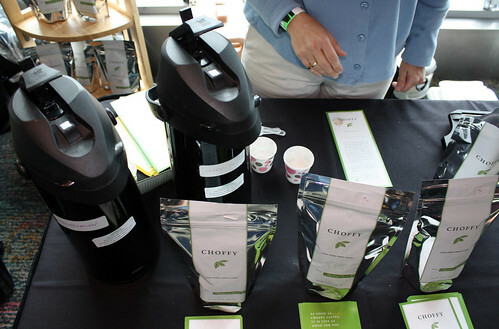 Choffy makes brewed chocolate–and yes, that’s “brewed” as in brewed coffee. Both Chris and I liked this stuff. 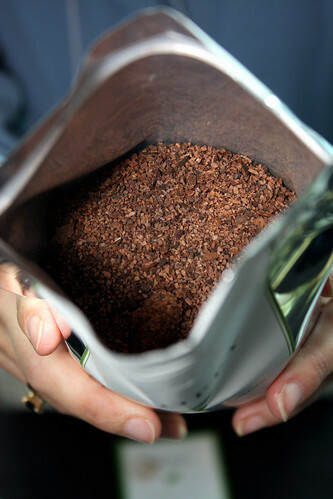 The flavor is light, falling somewhere between barley tea and coffee–well, a slightly chocolatey coffee. Whether or not I’d go out of my way to drink it instead of something else more readily available, I’m not sure, but I’d certainly enjoy having a full cup of it sometime to investigate further. 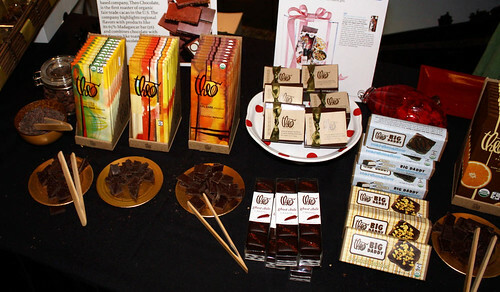 Eat Chocolates is another local chocolate company right here in Seattle. 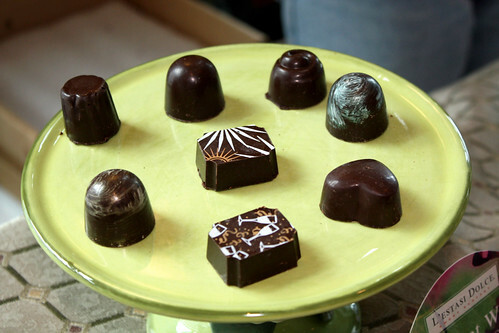 In addition to selling molded chocolates, they offer chocolate work classes (with a cap of 6 people per class), and you can even rent the kitchen and equipment to make your own chocolates with her assistance. I’m not sure how much that would end up costing, but considering how much I shelled out last year for just two chocolate molds, it could be a pretty good opportunity for some of us not-quite-professional chocolate types. 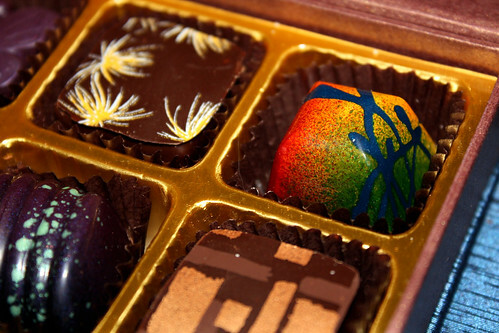 While this style of chocolates is typical for molded chocolates–cocoa butter transfer sheets, etc.–they still looked very pretty, especially displayed on the colorful slabs of marble. 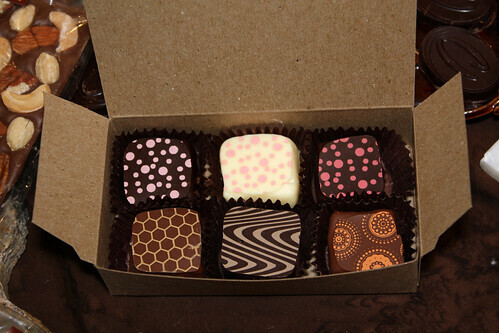 Hopefully I have these photogenic truffles matched up with the correct flavors–if not, oh well, they’re still pretty! 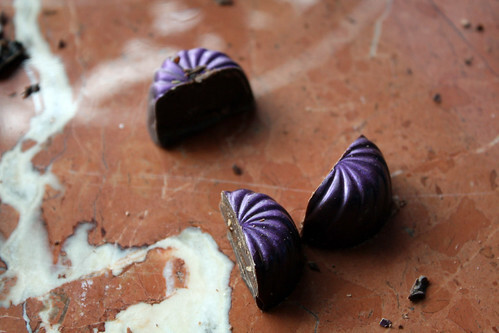 The Lavender truffles had a nice blend of lavender and chocolate. I was afraid the lavender would be overpowering, which often leads to the feeling that you’re eating soap (fancy soap, but soap nonetheless), but these were well balanced, with just a light suggestion of lavender. The Honey Thyme truffles were really different: almost savory, but in a good way, like Theo’s Coconut Curry bars. The 5-Spice Hazelnut Pralines packed a lot of flavor–a lot of spice, and I’m a person who triples the measurements for spices in recipes–and had a great crunch to them. The Orange White Chocolate truffles weren’t so powerful, though. I couldn’t taste much orange flavor in them. The Cardamom truffles were also light on flavor for my taste, but considering my love of cardamom is already well-documented, it may have been enough cardamom for most other people. And these were just plain cute. 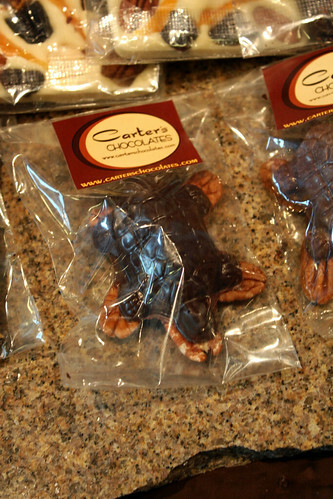 Carter’s Chocolates is another Washington chocolatier, this time in Port Orchard, WA. 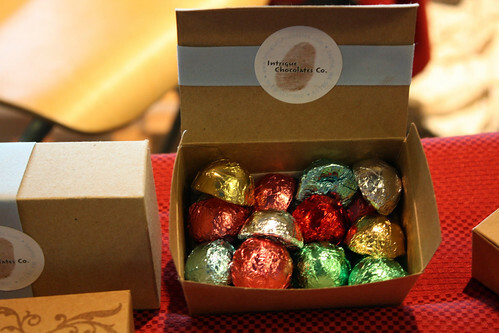 Their chocolates are also available at the Chocolate Box and Pike Pub in downtown Seattle, online, and at farmers markets in Port Orchard and Gig Harbor. They had quite a spread to sample from! Sadly, time and stomach-size restraints prevented us from tasting all of them. But with that many chocolates, fifty percent still adds up to quite a few to taste, and I got to enough of them to determine that they really know what they’re doing with flavor. 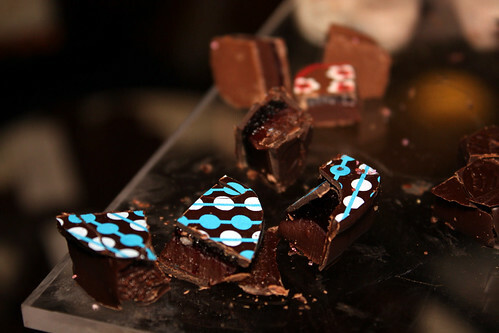 One of the really cool things about these chocolates is that rather than being molded in magnetic molds that hold a transfer sheet with a cocoa butter pattern so that it shows up on the top of each chocolate in the mold, Carter’s are individually hand-dipped in hand-tempered chocolate, then topped with a chocolate cutout with the colorful pattern on it. This gives them both a handcrafted feel and a professional, colorful finish at the same time. As for the flavors: the Blackberry Wine had a wonderful blackberry flavor to it, and the honey in the Honey Mead came through in a strong caramel flavor. The Raspberry Wine was similar to but lighter in flavor than the Blackberry, so I’d go with the Blackberry if I had to choose. The Orange Muscat was also sort of a repeat flavor for me, but this time with the Honey Mead. The Mint was weirdly similar to the curry chocolates I tasted that day–in a good way once again, but it was a strange connection for my taste buds to make. The Chai Tea was good, with plenty of spice, and the Sweet and Spicy Herbal Tea had a cool cinnamon finish to it. 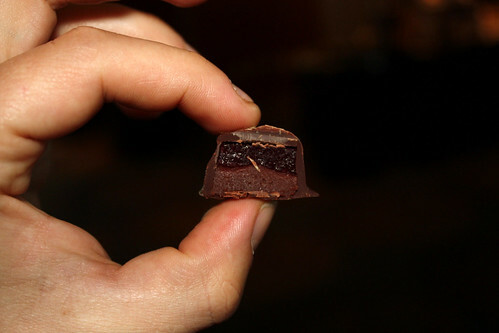 Their Chili truffle was one of the few to have both the flavor and heat, rather than one or the other (or neither). The Pike Old Bawdy Barley Wine was delicious, sweet and flavorful. The Pike XXXX Stout wasn’t my favorite (it had a sort of bitter beer flavor at the end), but Chris says it’s the best beer-flavored chocolate he’s ever had. I was very taken with their turtle-shaped turtles, even if it was hard to get a good photo of them. What a great idea! La Châtelaine Chocolat is a French chocolate shop in the Rocky Mountains in Montana. They were definitely in my top three at the Salon, all of which came, of course, once I was already getting much, much too full. If only I had decided to make the loop around the room in the other direction. 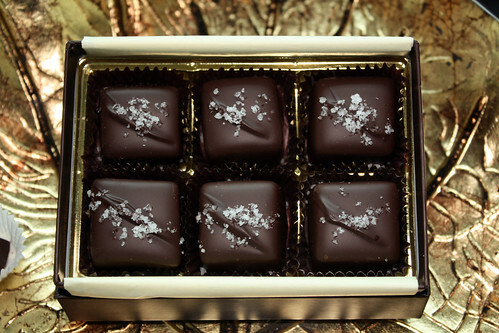 In their flavors, their textures, and even the thought and craft that I could tell went into their creation, La Châtelaine’s chocolates had that wonderful subtle, sophisticated quality that the best French pastries and confections have. 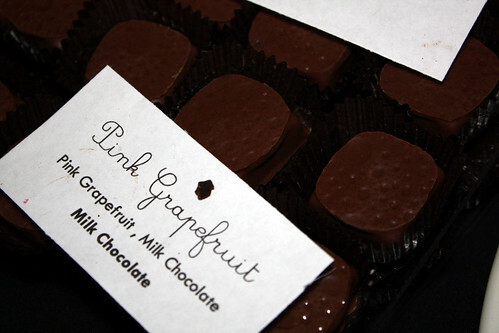 I was a little wary of grapefruit-flavored chocolate, especially grapefruit-flavored milk chocolate. I love grapefruit, but I have a hard enough time finding orange chocolates that I like, and I couldn’t really imagine how this combination would work. Well, it worked beautifully, because they earned not only a star in my notes, but a “wow”. I loved how much grapefruit flavor came through the chocolate, without there being a hint of bitterness at all. These were also visually interesting, with the grapefruit rind texture on their tops. These Pink Champagne truffles were very striking in person, rolled as they were in sparkling pink sugar. They had a nice, sweet champagne overtone and a very smooth texture. 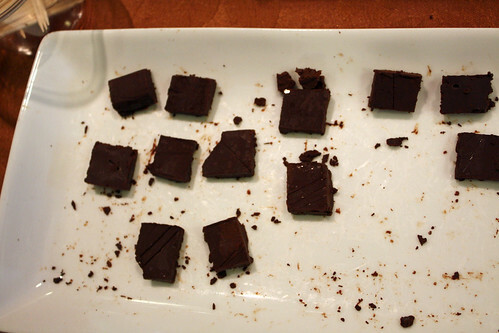 …but the Montana Huckleberry chocolates won the pates de fruit battle for me. I’d always wanted to try a huckleberry truffle, and these did not disappoint! 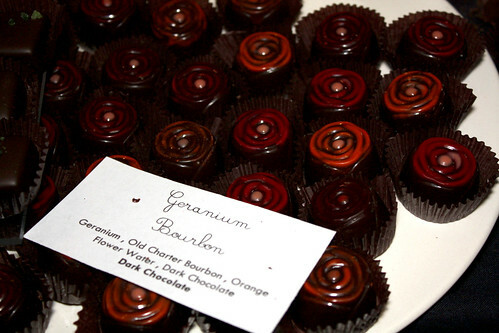 I also loved the Geranium Bourbon chocolates, and the Olive Oil and Almond ones. All in all, I was really impressed with what I tasted at La Châtelaine’s table. Chocolopolis is a chocolate shop in the Queen Anne neighborhood of Seattle. I have yet to get to the shop myself, but I’ve occasionally run across job postings to work there and daydreamed about working at such a fabulous-sounding place. What chocolate lover wouldn’t want to be surrounded by fine chocolate all day? While Chocolopolis generally sells rather than makes chocolate, they were launching a new line of in-house truffles at the chocolate show. They had a progression of six chocolates set out to taste. I thought it was interesting that they were serving small squares of a firm ganache rather than squares of straight chocolate. I asked if that was how they normally conducted their tastings, and it’s not–the ganache was to go with the truffle launch. But that got me thinking about doing a side-by-side tasting with some distinctive chocolates, both in their normal form and as ganache. It could be a great exercise for anyone interested in learning to taste chocolates with an eye to using them in the pastry kitchen. Watch this space…I may do a trial run of the idea soon. 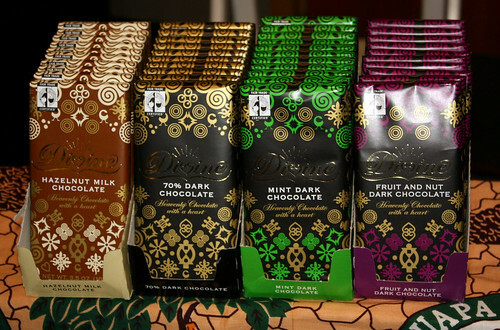 Divine Chocolate is another socially-conscious brand of chocolate. It’s really wonderful to see so much delicious fair-trade chocolates on the market these days. The Mint Dark Chocolate bar was awesome–kind of crunchy, with a more traditional mint-chocolate flavor than some of the more herbal mint chocolates we tried at other tables. I also liked the Fruit and Nut Dark Chocolate. It had a kind of trail-mix vibe from its tiny bits of nuts and fruit, which were much more prominent than the nut/fruit bars I tried at Theo’s table. The Hazelnut Milk Chocolate had an assertive milk chocolate flavor followed nicely by the hazelnut flavor as the milk chocolate wave subsided. My favorite of Divine’s chocolates was the White Chocolate with Strawberries bar. I got excited about it in the way I get excited about a good Merlot: I hate Merlot as a rule, so any time I taste one I actually like, I have to buy it. The same thing goes with white chocolate, although my dislike for Merlot does run quite a bit deeper. The reason I loved this bar was the way the acidity of the strawberries cut through the white chocolate. It made the white chocolate make sense. And now for a non-edible interlude! 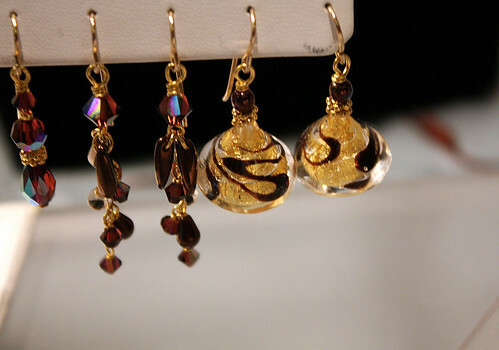 I Love Chocolate Jewelry specializes in glass jewelry that evokes the colors and shapes of chocolate. I really loved the rich browns and golds, so different than any of the glass I was able to find on our trip to Venice last year. Posh Chocolat, another chocolate company of several that represented Montana at the Salon, was the second of my top three tables of the day. As I mentioned before, all three fell at the end of our chocolate tour, when stomachs were overfull and palates should have been dull, and so that these companies broke through the chocolate glaze over our taste buds to win my top honors is all the more impressive. What I loved about Posh Chocolat was the savory quality of the flavor combinations, a quality that highlighted the chocolate that each flavor was blended with rather than fought against it. A comment on this brought out the news that the husband-and-wife chocolatier team came originally from the savory side of the kitchen. Even so, it still takes real talent and uncommon skill for a chef to apply their hot side sensibilities to the pastry world, especially with chocolates. 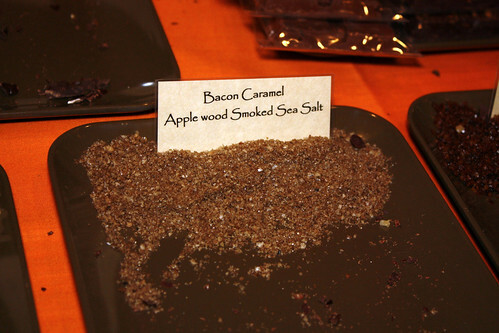 We got there too late for the Bacon Caramels with Applewood Smoked Sea Salt. Not that either of us could have tried them–we’re not of the odd but creative variety of vegetarians who count bacon as a vegetable–but we would have snagged a sample for the resident bacon enthusiast among Chris’ friends to try for us. When it came to the White Truffle Oil Caramels with Flaked Cypress Sea Salt, my first reaction upon tasting it was, and I quote: “salt…truffle?? ?” But despite the strangeness of that combo on my taste buds, and the inclusion of truffle oil (truffles are another ingredient that I don’t care for, though I wish I did), I enjoyed this one. The flavor was incredibly complex, with the truffle adding to the experience rather than overpowering it. The Thai Peanut Caramels with Ginger Sea Salt were one of my favorite things I tasted all day, and a perfect example of what I was saying before about their deft touch with savory flavors in their chocolates. 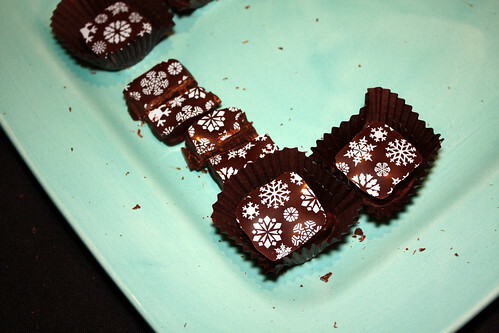 While the Coconut Curry bar at Theo’s table focused on pairing the curry flavors with the sweetness in the chocolate, Posh’s Thai Peanut Caramels seemed to marry the curry spices to the essential chocolate flavor in the chocolate, rather than the sugar. 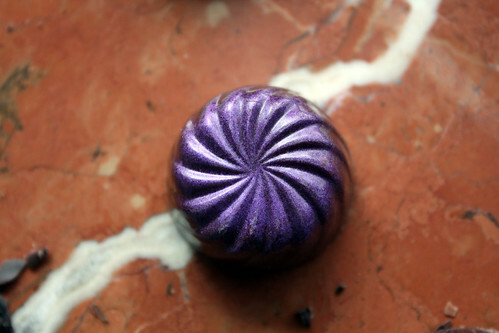 The Ras al Hanout chocolates were once again–and I hate how I’m overusing this word, but nothing else really fits what I tasted–very deliciously savory, with a surprisingly subtle use of the famous Moroccan spice blend. 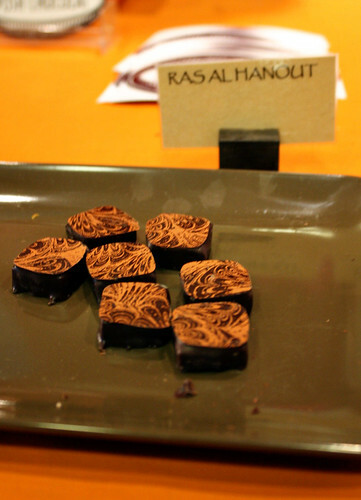 The Rose Water chocolates had a very strong, beautiful flavor, with the rose coming through most intensely at the end. Rose water and chocolate could have had that sad, soapy flavor that I was talking about with lavender earlier, but these were really wonderful. Apparently they use rose oil rather than rose water to flavor them, and that makes all the difference. The Mojito chocolates were also outstanding, very minty with a hint of rum, and the lime played straight into the fruitiness of the chocolate. Posh also offered a pair of chili chocolates, one a 74% Ecuadorian Dark Chocolate bar that had an immediate assault of spice on the tip of my tongue, the other a 57% Single Origin Ecuadorian Milk Chocolate bar with Tipus Chilis that had a great chili flavor, a rare accomplishment as I’ve mentioned before. Our trip to the Posh table ended with a taste of some of the richest, most decadent hot chocolate I’ve ever tasted. Crave Chocolate also hails from Montana. Despite the state’s drive-quickly-through reputation, apparently there are lots of places for chocolate lovers to visit there! Both the Rainbow and the Apres Ski had nice, strong flavors–raspberry and lime, respectively. The Lavender Blueberry chocolates tasted strangely like the chocolate-covered blueberry confections we got from Harry and David for our candy buffet at our wedding. Not that that’s a bad thing, but it left me wondering why my mind was making that connection. I finally decided it must be the subtle influence of the lavender. The Mint Julep chocolate wasn’t my favorite, with a muddled, less-defined flavor profile, but the Yellowstone had a creamy chai flavor that was quite pleasant. Amano‘s table was perhaps the table that suffered the most from being at the end of our loop through the Salon. They had several varieties of artisanal chocolate set out, plus had several kinds of nibs to sample. 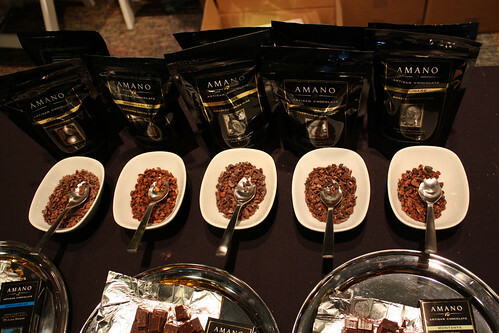 My poor tongue was too exhausted for a true chocolate tasting at that point. Mix in some lime or spices and those I could taste, but I was not up to the task of identifying and contrasting subtle flavor differences. Still, I was able to figure out which were my favorites in the bunch, or at least which tasted best to my compromised palate. Out of the chocolates, my favorite was the Madagascar 70%, which was very fruity with a warm yet bitter finish. “Fruity” and “bitter” pretty much characterized all of their chocolates (or what flavors I could still taste), and the particular variations on those flavors in the Madagascar bar worked the best for me. The Ocumare 70% tasted quite a bit like the Madagascar, but with a more muted fruit flavor and an odd bitterness that showed up in the middle of the flavor curve. The Montanya 70% was sweeter and milder, but the bitterness in this bar presented itself as a weird dry feeling on the top of my tongue. The Jembrana 70% was milder yet, and worked much better in the milk chocolate form I sampled next. Typing this up now, I wonder if I started at the wrong end of this table, as my impressions might have been very different if I’d gone from the mildest chocolate to the most intense. The nibs were harder to compare, but in the end I decided I liked the fruity Ocumare nibs the best. What struck me the most about tasting the nibs is that their flavors didn’t really line up to the flavors of the corresponding bars. I have a lot of respect for anyone capable of selecting and blending beans into a fantastic chocolate. All in all, I really wish I’d visited this table first. 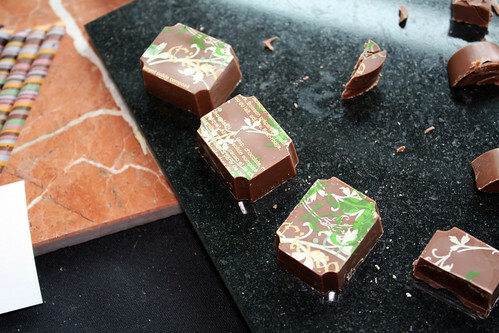 The chocolate seemed to be very good quality, and I would have enjoyed tasting it on a fresher palate. 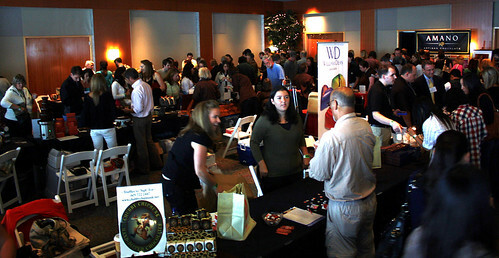 Intrigue Chocolates is another local chocolate business–very local, as in from right here in Seattle. They were one of Chris’ favorite tables (hard for them not to be, since they had his favorite of all the chili chocolates at the Salon), and I was impressed with their bold, complex flavor combinations. The best part about the Salon for me was the chance to talk to and learn from the chocolatiers, and the guys at Intrigue explained something about flavoring chocolates that should have been obvious but had never occurred to me: many of the things we use to flavor truffles are water-based flavors, steeped in the cream that’s used to make the ganache. But chocolate is oil-based. 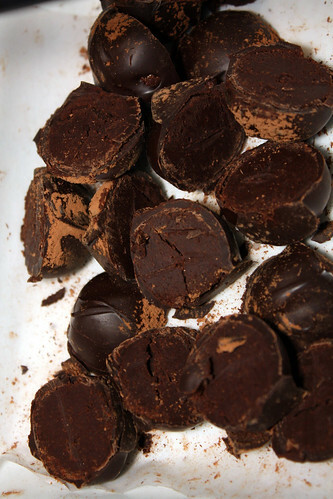 That means that oil-based flavors are going to mix into the chocolate itself better than water-based ones, demonstrated in their vibrant truffles. 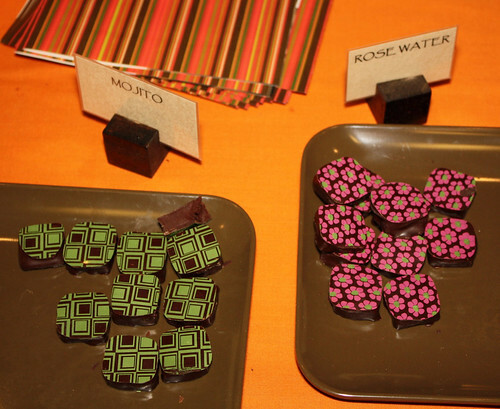 The Grapefruit, Mojito, and Saint Basil truffles all showed off Intrigue’s ability to pack fresh, true flavor into their chocolates, something that was especially noteworthy in the Grapefruit truffle. The Paradise truffle takes its name and subtle peppery flavor from the Grains of Paradise spice–interesting, but the flavor was perhaps a little too subtle in comparison to their other offerings. The Jamaican Hot Chocolate truffle was the chili chocolate that won Chris over, and I was amazed at the ring of spiciness that hit the back of my throat when I tried it. Due to the fact that it gets it chili infusion from habaneros steeped in rum, we now have an incredibly spicy jar of rum in our house, waiting to be experimented with. 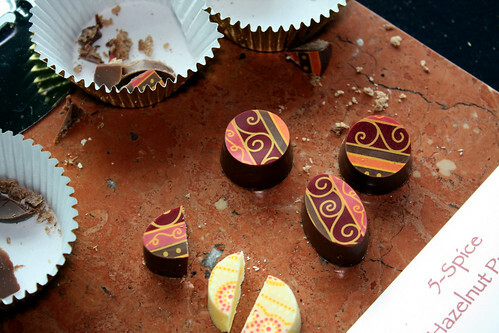 Suess Chocolates & Pastries in Madison Valley is dedicated to handcrafting German chocolates and pastries based on their German grandmother’s recipes. 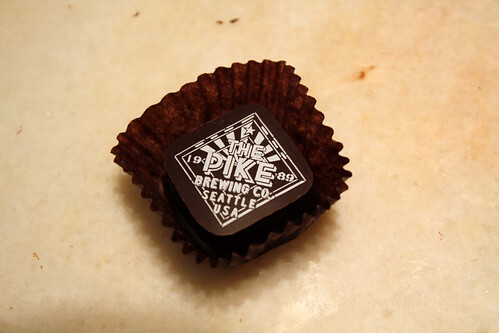 It is–according to its owners–the only kid-friendly chocolate shop in Seattle. Children are encouraged to participate in their own complimentary chocolate dipping. As the current constant carrier of a future foodie, this sounds like a very kid- and parent-friendly idea, because at least you could leave whatever part of the mess that didn’t fall on the little one behind at the shop. 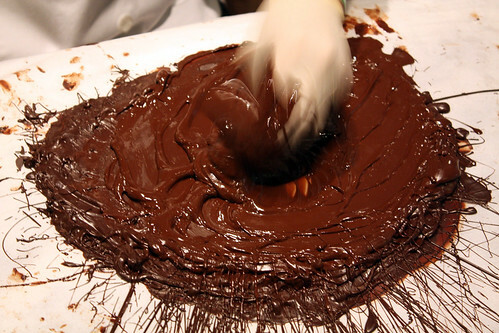 They also hold weekend chocolate classes for kids and adults. I’ve had tea-infused chocolates before–I think I may have even made one myself before–but never any with a strong enough tea flavor to really make it stand out. 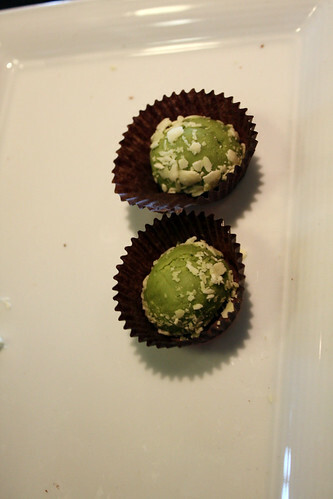 Suess’ Matcha Green Tea truffles broke that pattern. The intense green tea flavor seemed to ride the white chocolate, and I liked it a lot more than I expected. Now I understand! I also tried the Raspberry Wasabi and Creme Fraiche truffles. The Raspberry Wasabi was really interesting in the way the wasabi counterpointed the raspberry flavor without trying to be the star of the show, a blend that I liked a lot. The Creme Fraiche was okay, but more sour than I expected. Suess is pushing the boundaries of adventurous truffle flavors, though, and more often than not I was surprised and pleased by what I tasted. As I rounded the corner of the inner square of tables at the Salon, we were racing against the clock, but there were only four or five tables left to visit. Surely we could make it before time and/or chocolate ran out! But the first of these was William Dean Chocolates, and after only a few minutes of talking to William Dean Brown and tasting a few of his chocolates, I knew I wouldn’t be going anywhere. His was the last of my top three tables I mentioned above, and it was also my favorite out of the three. I tasted some amazing confections that brought me back to the time in pastry school when I was first exposed to so many ingredients and classic recipes. I also learned a lot just from talking to this chocolatier who was so obviously passionate about his craft and so willing to pass on what he’d learned. Our conversation made me really miss being in the business and learning from experienced chefs, but only in the best of ways. It was wonderful to revisit the excitement of the world opening up for my eyes, mind and palate at the same time. 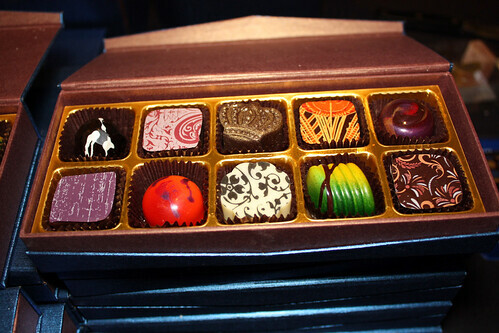 Not only do his chocolates look absolutely gorgeous, but they taste absolutely gorgeous as well. He orchestrates the order in which the flavors hit your palate. 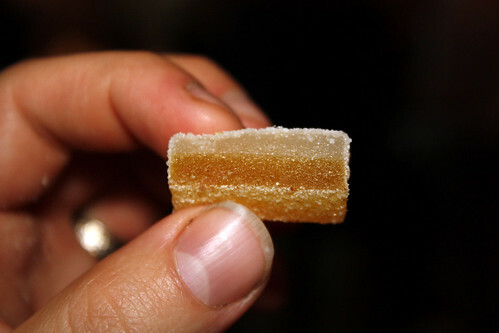 For example, in this pina colada pate de fruit, first I tasted the pineapple, then the rum, and then, finally, the coconut. I always thought that such feats were happy accidents. However, the more I talked with him, the more I realized that he was ordering the flavors this way intentionally, so that you really taste each one, clear and clean. I had to ask if there was a method to it, or if it just was a product of experience and lots of trial and error. He explained that certain types of flavors hit in a certain order: fruits first, then herbs, then heat. Also, over time, the flavor of herbs gets stronger, while that of citrus gets weaker, and so you have to account for that when you make the chocolates so they’ll be well balanced later. Obviously, there has to be more to this, but I’m really fascinated by these concepts and eager to learn more. You can definitely expect to see a post from me testing them out. 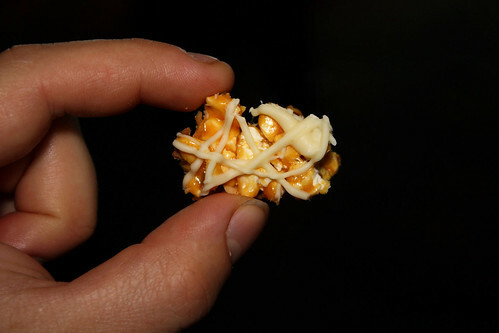 I also learned other things, like the trick of adding extra chocolate to chocolate nougat (so, so good) to prolong the shelf life, and that they use microwave popcorn in their gourmet popcorn line because it’s the only popcorn that stays crisp–microwave popcorn! Amazing. 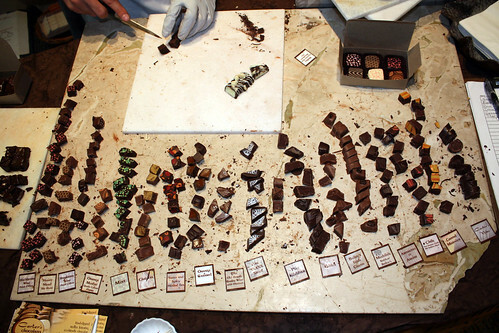 As for the individual chocolates and confections…I must say, the conversation was so interesting and the samples were coming so quickly that my tasting notes are a mess of hasty scribbles accompanied by stars (my way of marking the chocolates that really stood out to me at the Salon). There was some sort of delicious amaretto cherry marzipan–at least, I think that word I mangled there is cherry, but I can’t find it on his website to confirm–that was just amazing; a Peanut Butter Krunch chocolate that really crunched from the bits of peanut brittle inside; a Lavender/Lemon soft caramel in white chocolate that had a light, smooth caramel infused with fresh lemon flavor; a macadamia nut marzipan that had a really fun texture to it; a mango chili chocolate–I think perhaps his Mexican Mango–with just a beautiful blend of the mango and chilies to it; a Grapefruit & Tarragon chocolate–very different from any of the other grapefruit chocolates at the Salon–that really impressed me with the way he used a slight bit of the bitterness of the grapefruit to blend with the tarragon…and on and on. Chris and I also both thought that William Dean’s packaging was very well designed. This was the only table we actually bought something at–a box of twelve chocolates that met a truly tragic demise during Seattle’s recent wave of extreme heat–and while we were blown away by how good the chocolates were, the visual appeal of the chocolates and the box they came in definitely factored into our decision to pull out the plastic. The boxes feel substantial, and they just look like something you want to own, want to give someone as a gift. But, really, the main reason we bought a box of William Dean’s chocolates was those were the kind of chocolates I was so inspired by in pastry school. And that’s how I felt as I left the Salon: inspired. Well, inspired and very, very full. I never thought I’d ever say this, but I hope I never eat that much chocolate in one day–much less four hours–ever again in my life. Except, perhaps, when we go back the the Chocolate Salon next year. We’ll see if I’ve learned my lesson, or if the siren song of all those chocolates wins again. And now I’m going to put my left hand on my copy of The Professional Pastry Chef, raise my right hand, and vow never to write another blog post this long again. And I thought some of my older ones were epic! Now I can focus on some of the other posts I have patiently waiting their turn: a berry lemon tart and lemon curd recipe review, a Dala horse cake for my mother’s birthday, and my discovery of the best cake recipe I’ve made in my life, along with the peanut butter milk chocolate ganache I invented to go along with it for Chris’ cousin’s camping-themed groom’s cake. I’ve only got about fourteen more weeks until the Tiger Cub comes out into the world, so I’d better get my food blogging in now. 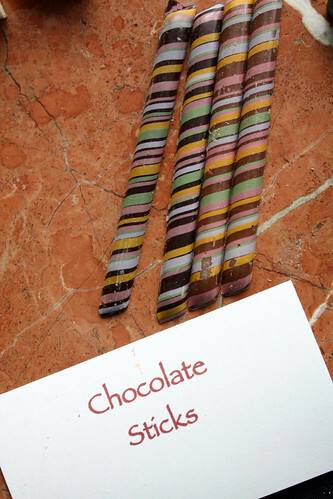 This entry was posted in Confections and tagged chocolate on August 27, 2009 by Jessica Petersen. Wow. Just…wow. I’m not a chocolate fan in general (I definitely appreciate it but will usually go with something fruity) but THOSE are all the kinds of chocolates I like. 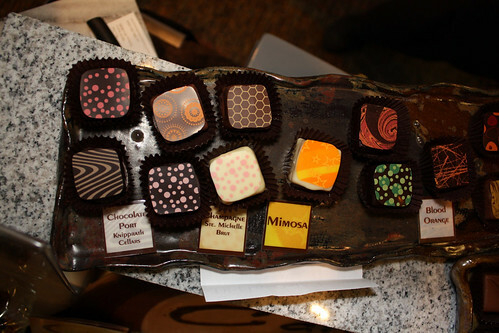 Especially the very gorgeous colorful little truffles with the very creative flavors. Wish I was there! Very fascinating about the science of flavors being tasted in order, too. I’ve definitely had that phenomenon happen in things I’ve made but it’s never intentional – sometimes the flavors blend and other times they hit you one after the other. Seems like I’d have to do a lot of studying to learn how to orchestrate it myself though! 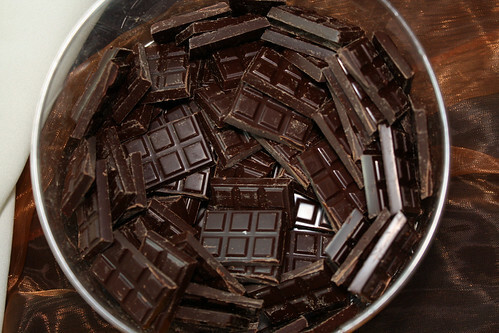 I think just about anyone short of my friend who’s allergic to chocolate could’ve found something to love there. Wait, no, there were also a winery and a bottled tea/juice beverage company giving out samples there, so even if she didn’t want the wine, I know she would’ve liked the tea. Yeah, I’m fascinated with the flavor concepts but not really sure where to start looking for more information! But at least I think I’ll do an informal experiment sometime soon, just to see if I can get some results that way. Chocolate and cream are easy to come by, so I just have to figure out what flavoring agents to add. 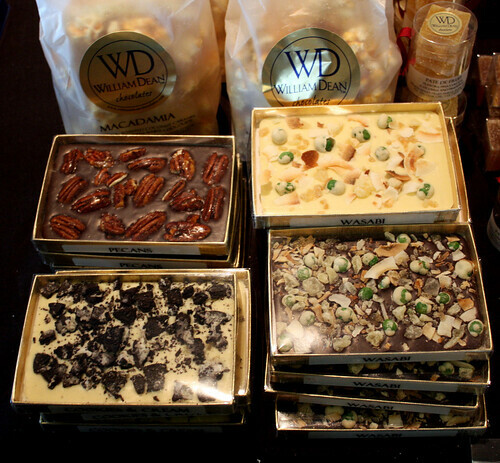 I was at the Seattle Chocolate Salon too and loved the William Dean chocolates as well.. did you have a chance to try the blue cheese ones? .-= alice´s last blog ..Daring Bakers Challenge: Dobos Torte Recipe =-. That sounds really familiar. I think he offered me a taste but I unfortunately turned it down since I was being a little paranoid about the no soft/blue cheeses during pregnancy thing at the time. I wish I had made an exception, though. I’m really curious about it. Wwhat a thorough treatment of the Salon! 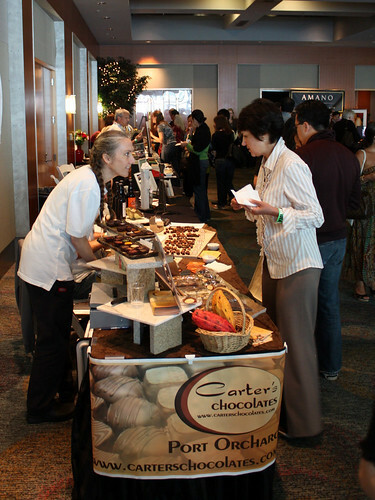 I was stuck behind my table all day, and only got to try maybe three other chocolatiers’ offerings. But even the few I tried, by the time I got home had blended together inmy memory, the only think standing out being the Intrigue Chocolates’ Grapefruit truffle, and william Dean’s amazing packaging. Thank you so much for doing such an excellent job. Thank you! I’m glad you enjoyed the article…it took days to write, but I didn’t want to short change any of the chocolates! They were all so good. 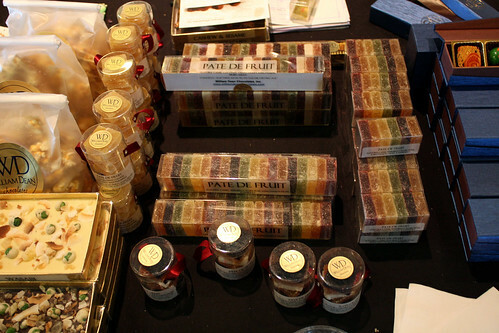 And thanks for taking good care of us at your booth…as you can read, we really enjoyed your chocolates!